We at ArneTech are frequent visitors and sponsors at Community Engagement and Local Government conferences. In the last few weeks we attended both the Engage2Act (Un)Conference in Melbourne in March and the LocalGov Summit in Sydney in April. This is a short recap of those conferences. Engage2Act (Un)Conference was held in Moonee Ponds Clocktower Center in Northern Melbourne. Moonee Vallee City Council was one of the sponsors and organisers and had provided the venue. The whole conference is organised by volunteers and is non-commercial which gives it a positively different flair. The conference was attended by over 100 people and it was a busy day. What was special about the conference is the fact that the conference didn't have a set agenda. Instead after a very positive and enlightening "Welcome to Country" ceremony all the delegates created the agenda using "open space" co-creation method. Anyone could suggest a session as long as he/she was willing to lead it. In the end we had more suggestions than the organisers were prepared for but that was too easily solved by grouping some of the topics together. It does sound a bit chaotic but the power of the method was that all the topics of the day were something that the delegates were thinking about and wanted to learn more about or to discuss. Through this process everyone could make sure that their interests and needs for the day were covered. Of course not all suggestions got enough votes to be selected but there were still plenty of extremely interesting topics for all to attend to. ArneTech was represented by Albert Matthews and Kristian Jaakkola. They hosted sessions on "Budget for Engagement should not be an afterthought" and "Engagement Frameworks and Strategies". Both sessions were well-attended and had very good discussions - as all the sessions that we went to. In addition in the trade show corner ArneTech had a stand and many delegates used the chance to learn more about the work ArneTech does and to have discussions with us. After a long and productive conference day, there was some nibbles and drink at a near-by pub for more networking and discussions. The conference was very well organised and we were impressed with the content and the "flow" of the event. We would like to extend a huge thank you to the E2A volunteers that made it happen. LocalGov Summit is a new event organised by Captivate Conferences (the organiser of Community Engagement Summit Series) and it was held April 11-12 in Sydney. The Summit gathered general managers, CEOs, councillors, strategic planners, communication and engagement managers etc. from local governments across Australia. The two day conference was focused on real outcomes and leading-edge initiatives, harnessing the ways new technologies can transform how local government works. During the days we heard many presentations from leading experts and interesting panel discussions by executives in local government. The summit had a very interactive approach and thus there was a lot of speed-dating, group discussions and brainstorming involved. Everyone we spoke to were very happy and impressed with the conference and the content. In addition there was networking drinks and a dinner on the evening of the first day. Most of the delegates attended that as well. ArneTech was a platinum sponsor at the end and the managing director and founder of ArneTech, Kristian Jaakkola, was attending the conference. Kristian also delivered a presentation on "Engagement for Executives" that got very good feedback and lead to many follow-up discussion. 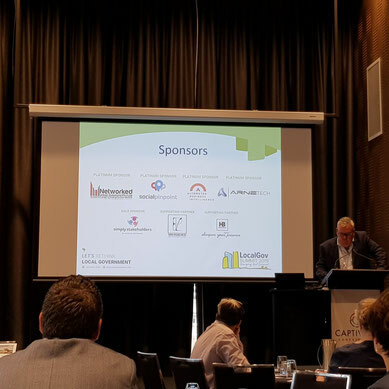 ArneTech was happy to be part of the conference and we would like to thank Darius Turner and Captivate Conferences on organising an excellent summit and we're looking forward to the next year edition. With the success this year, the number of delegates is bound to double next year! Come and see us & talk to us at the various events that we're attending. Some of the future events that we're sponsoring are for instance the Community Engagement Summit in Perth in August 7-8 and Community Engagement Summit in Sydney in November 20-21.